The coast of Jæren is open to the vast Atlantic ocean. This means waves, big waves – for better and for worse. For a sailor it provides the challenge of a long stretch of unprotected waters where there’s not a lot of places to hide if the wind or swell picks up. You pretty much have to sail on or turn around and go back if things get nasty. 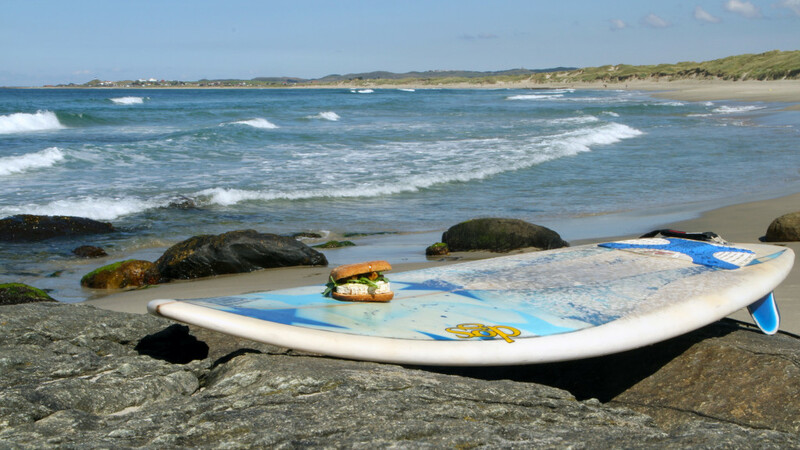 But it also means that Jæren is one of the best places to surf along the coast. In fact, it was where surfing first took hold in Norway. There are long beaches and a lot of different spots to choose from, depending on the direction of the swell. For a kook like me, it held the promise of lots of fun and water up the nose. But, hey, didn’t I just sell my board before embarking on this trip? Yup. I just wasn’t good enough for that board. Yet. And, more importantly, I had found a shaper on Jæren who would not only construct a board for me, but teach me how to shape it myself! Jan-Ivar Tjøstheim (@snekkerjani on insta!) is an excellent craftsman and an avid surfer. And he’s the quintessential outdoorsy Norwegian. Anything from fly fishing to paragliding – he’s into it and he’s good at it! 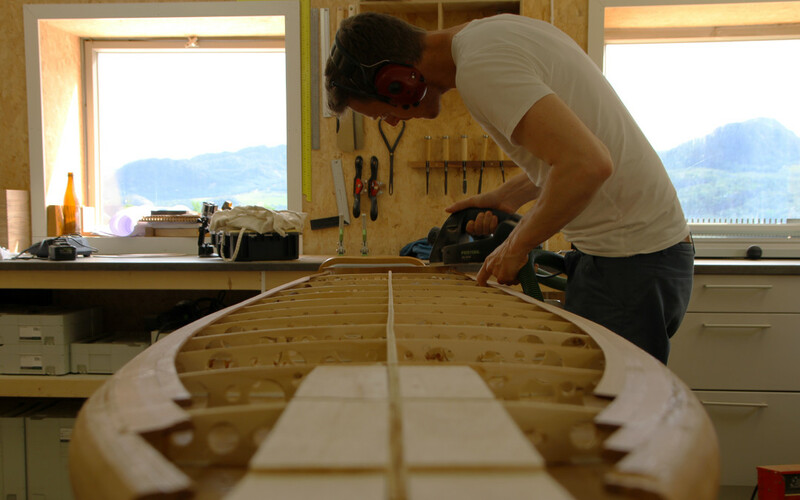 He’s built some stunning canoes, a trade he learned in Canada. His two daughters are growing up partly under the open sky, partly building viking chairs in his workshop. Just like his outdoors interests, his craft is not limited to one thing. He’s the guy who can build you a kitchen, a shop front, a lounge chair … or a surfboard. He builds the kind of surfboards that makes you lose your breath, simply because of the sheer beauty. Cedar wood, handpicked, shaped to perfection. He’s had people climbing his van and pretty much drooling all over his boards. And he laughingly admitted that it’s a bit harder to hide in the lineup or to just check out a spot without paddling out nowadays. Oops, I’m doomed. Everyone is going to think I’m an amazing surfer now. Oh well, I can live with having a gorgeous board, I guess. I spent a few days in Jani’s workshop, learning the basics of shaping, and he happens to be an excellent teacher. After all, it’s been his profession, so he has the patience and the pedagogical mindset necessary. I felt like I could really do this! And now that the board is with me on the boat, with work still to be done, he’s made me feel confident that I’m capable of finishing it on my own. I actually think Jani’s future lies in giving shaping workshops. There’s only so many boards you can shape at any given time when you are just one man. Teaching the trade, on the other hand … So many surfers want to shape their own boards. I couldn’t imagine a better place to learn it. And I honestly think learning a craft from Jani would be great for non-surfers, yogis and anyone who needs to get a bit un-stuck in their lives or minds. I talk a lot about challenges and creativity in yoga, because I believe that growing, playing and learning is not something that should stop once we’ve reached adulthood. If we let it, we can grow and play and learn and develop throughout our entire lives. Isn’t that what living is? Building something, shaping something with your own hands – to me that is truly living. And so is playing in the waves, of course. I can’t believe my luck, but I probably got to be on Boresanden Beach the best day of this summer. Sure, the waves were pretty small. Which is fine by me. It was sunny and warm, and I nearly had a heat stroke inside of my 6mm wetsuit. Me, Jani and Rune, a surfing buddy of his, took out some boards and had a day that matches anything I’ve experienced in Portugal or Morocco. White sand, great people, waves and lunch.